Time lapse, long exposure, and days of sitting and watching. The trip started with shooting over 5,000 images to create a time lapse video of my drive to the park. I spent the early mornings and late evening scouting with no luck. 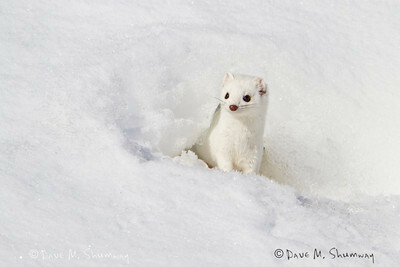 I spent my mid days sitting and waiting for Ermine to come out and grant me a few images. I put many miles on my hiking boots and on my snow shoes during the trip while taking very few photos, other than the time lapse. The temps ranged from about 10° to over 50°. I experienced snow, rain, and lots of sun (even with sun screen I got a bit too much). The bugs are begging to hatch along the Yellowstone river, bird activity is picking up (slowly), Bears are out and on the move (sorry no bear photos), Wolf activity is a bit slow; but still more than easy to view daily with scopes. then you have had the play by play of this trip. I hope you enjoyed being able to follow along during the trip.